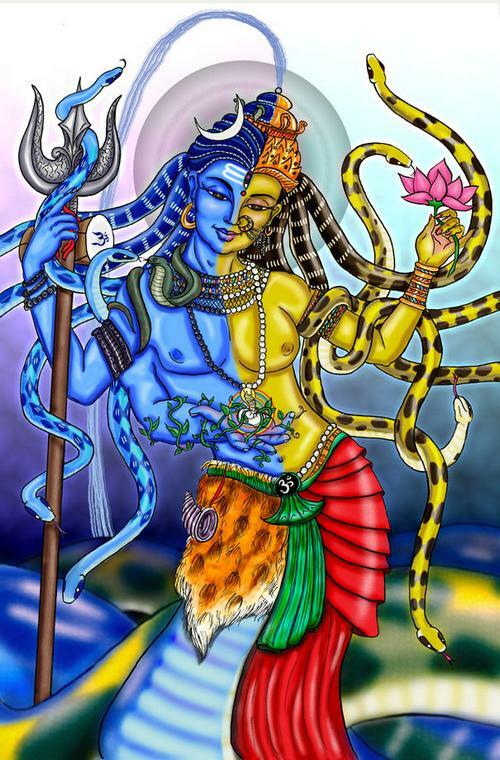 In both the Shakta and Shaiva traditions of Tantra school, the Ultimate Reality is conceived as the Unity of Shakti and Shiva They are regarded as one. Ardhanarishvara “the Lord Whose Half Is Woman” represents a transgendered being created by the union of Shiva (male) and Shakti (female). The Ardhanari form illustrates how the female principle of God- Shakti is inseparable from the male principle of God – Shiva. The Ardhanarishvara, above all, represents the totality that lies beyond duality. 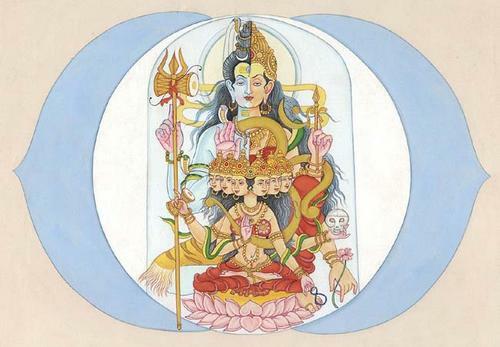 Siva in the compound form of Ardha-nari is a hermaphrodite from whose womb the phenomenal existence proceeds. 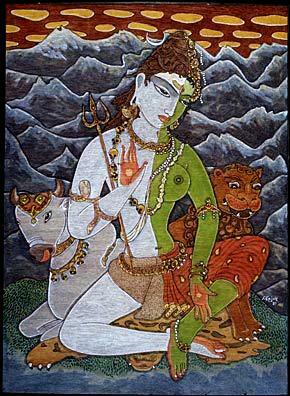 Shiva Ardha-nari is described, as being the Soul of the World, and as partaking of the nature of both sexes. From him, all existence is derived. The creation is evolving itself. Death is nothing more than a change of body and a passing from state of visibility into invisibility. Every moment, some part of the world passes into this Invisibility. It does not utterly perish, but only disappears from our sight, or being translated into some other form. According to Shaktha tradition, Devi is identified as the source of all manifestation, male and female … it is her body that splits in half. In other words, she is the androgynous divine. Shakthas therefore customarily refer to the hermaphrodite from as Ardhanarishwari using the feminine ending i to suggest saying she is “a goddess who is half woman”. The significance of this view is rather interesting. Shakta creation theories place the Goddess at the center of the scheme of things. 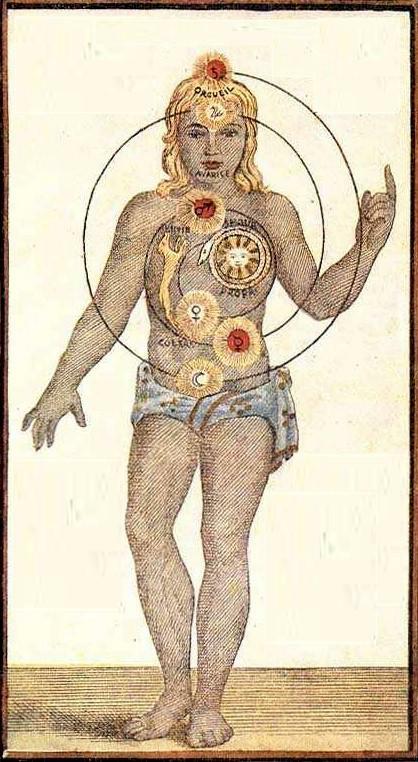 They argue that since the nature of the Cosmos is reflected in the human body; and since it is the Female who gestates and gives birth to new life, it is appropriate to recognize the hermaphrodite from as being principally feminine. In the Shakta view, the Ardhanarishwari illustrates Devi, the Goddess, as producing her consort Shiva out of herself, balancing perfectly her feminine and masculine aspects. Ardha-nari in iconography is depicted as half-male and half-female. Ardhanarishvara is typically shown with the left half of his body being female and the right half, male. The female (Shakti, or Parvati, or Uma) half is usually garbed in red and often holds a lotus, while the male half (Shiva) wears a tiger skin or an ascetic’s cloth around the waist. The skin of the female half is tan, while that of the male half is light blue. His/her gaze is pensive, serene; his/her pose sensuous, inviting. The cult of Ardhanarishvara appears to have reached a pinnacle during the tenth through the twelfth centuries and again in the eighteenth and early nineteenth centuries, when he-she became a popular subject in sculpture and painting. The best sculptural depictions of Shiva as Ardhanari are to be seen in the sensuous Chola dynasty bronzes and the sculptures at Ellora and Elephanta. “It was as though two objects were simultaneously perceived in close proximity. In one half it was as white as camphor and in the other half it is as red as red lead. The body of a single unit was highly wonderful. In one-half there was flowing tresses. In the middle of the necklace there was a flower. The body of the crescent moon-crested Lord had silk in one-half that was beautiful with a single anklet, ear-ring and bracelet. The body of the companion of Kubera shone with a single breast“. His is the dance that destroys everything. I bow to the Mother of the Universe. I bow to the Father of the Universe. Please also check the Shaktha version of Ardhanareeshwari Stotra a beautiful poetry which sings the glory and the sublime beauty of the Mother as Ardha nari. Rig Veda also speaks about the One appearing as many; and the single egg splitting into Bhuta and Prana. ‘He, who is described as male, is as much the female and the penetrating eye does not fail to see it’. The male is only so much male as much he is female; and the female is only as much female as much she is male. The maleness and femaleness are the attributes contained in one frame. In the hymn ‘Ekohum bahusyami’ (Shiva Purana), Shiva says, I am One, but wishes to be many. The imagery of the all enveloping space issuing out of a dimension-less Bindu often occurs in Tantric texts. The Bindu at the center of the Sri Chakrais the symbolic representation of the complete harmony (samarasya) of Shiva (consciousness) and Shakti (energy). It signifies a state of non-duality where all tendencies and distinctions have vanished. By worshipping the Devi in Sri Chakra one is actually worshipping the highest ultimate force in the Tantric ideology, Sri Ardhanari, where all aspects are non-existent. The followers of Sri Vidya who worship the Sri Chakra too envision the deity as Mother Goddess. It is explained the Sri Chakra is itself androgynous by its very nature .Bindu is Kameshwara, the ground of the universe; the trikona is Kameshwari the mother of the universe. The union of the two is Sri Chakra, which in its androgynous form symbolizes the underlying unitary principle in all existence. The Samayin school of Sri Vidya regards Shiva and Shakthi as one; Shiva becomes Kameshwara and Kameshwari becomes Shiva. The identity of Shiva and Shakthi is the foundation of phenomenal manifestation in order to create (srusti), preserve (sthithi) and withdraw (samhara). This school regards Shiva as Dakshina_ murthi. The expression Dakshina means a woman, a female principle which is competent to create, unfold and manifest. And, when Dakshina assumes a form as Dakshina_murthi, it is Ardha-nari. Kashmiri Shaivism too argues that the Absolute is not merely self-luminous but is also self-consciousness and dynamic. The two aspects of self-luminosity (svaprakasha) and self-consciousness (vimarsha) are the representations of Shiva and Shakthi. And, their non-duality is figuratively expressed through the concept and the form of Ardha–nari, the two conjoined- the one as two and inseparable. This school believes that the Absolute manifests itself as multiplicity while never shedding its fundamental nature. The entire world of experience –diversity and unity, subjective or objective- is the manifestation of the Absolute. The relationship between the world of manifestation and multiplicity, with the Absolute is sought to be explained with the analogy of the gold and the ornaments made out of it.Shiva is the essence and when this force fuses with Shakthi it results in multitude of manifestations. The relation between Shiva and Shakthi is also compared to the relation between the sun and its rays. The analogy represents the union of the core substance and energy it radiates; the Being and his Shakti. It embodies the principle of Ardhanaeeshwara. Brahman is static Shakti; and Shakti is dynamic Brahman. Ajna chakra is positioned at the eyebrow region and is said to represent the psychic channels Ida and Pingala which meet here with the central shushumna channel, before rising to the crown chakra, Sahasra. Ajna is considered the chakra of the mind. It is the seat of intuition, and the ability to see the underlying reasons behind everything. It is here that all energies of the body meet up and become one. The presiding over this chakra is, aptly, the Ardhanareeshwara also called Shukla –mahakala, a hermaphrodite form of Shiva-Shakthi symbolizing the primordial duality of Subject and Object and the culmination of all energies. The deity of this chakra is Haakinii, the one with six faces and six arms. Rig Veda speaks about Dyava-Prihtvi Heaven and Earth as parents who sustain all creatures; they are also the parents of the gods. One is a prolific bull and the other a variegated cow, both being rich in seed. In this case, the Earth or Matter was the wife; and the Soul often identified with Heaven or the subtle ether was the husband. By their conjunction all things come in to existence. So inseparable is their union, as father and mother, that the two blend together, forming one great Hermaphroditic deity from whom sprang every varied part of the Universe. In this material system, the Intelligent Being was sometimes regarded the animating Soul and sometimes the husband of the Universe (purusha), while the Universe ( creation ) on the other hand was sometimes reckoned the body and sometimes the wife of the Intelligent Being (prakriti). The husband and wife blended together into one hermaphrodite; whatever is said of the one is also said of the other. Shiva and Parvathi form that compound deity partaking of both sexes, the Ardha-Nari. The union of the two is as perfect as that of the soul and body in a person. The Great Poet Kalidasa hails the two as inseparable like the word (vak) and its meaning (artha). The expression Purusha etymologically signifies that which moves ahead (purati agre gachchhati) . It is derived from the root pf which carries shades of meanings as protecting, pervading, filling etc. Prakriti the feminine principle represents matter, nature and life . Prakriti evolves, changes and binds; but it needs the presence of Purusha to enliven, to create and to preserve life. The Universe is the manifestation of Purusha and Prakriti, entwined inseparably. Zohar considered the most important work of kabbalah or Jewish mysticism too holds the belief that the Godhead is complex, rather than simple, and that divinity is dynamic and incorporates gender, having both male and female dimensions. The oneness of God is perceived in androgynous terms as the pairing of male and female; the former characterized as the capacity to overflow and the latter as the potential to receive. We sometimes find in these texts the serpent was produced from the egg, and sometimes the egg from the serpent. They stand therefore connected mutually with each other in the relation of parent and child. It is perhaps that contradictory relationship which is feigned to subsist between the great father and the great mother. The one is said to be the husband of the other; and from their mystic embrace all things are generated: yet the great father is described as the parent of his consort; and the great mother is represented as the parent of her husband. But the great father was Adam reappearing in Noah: and the great mother was the Earth melting into the character of that smaller world the Ark. These two being blended into one, whatever is said of the former is equally said of the latter: and, as the great god was also a goddess, and as the great goddess was also a god; each of them, by whatever name they may be distinguished, is alike pronounced to be one and all things. Such is also the character of Janus, Jupiter, Pan, and every other chief god: they are declared to be each the same person. Such also is the character of Isis, Isi, Venus, and the other kindred goddesses: they are each declared to be one person, and properly they are the Earth and the Ark viewed conjointly; yet, from their hermaphroditic union with the great father, they are each like him declared to be the Universe. The Shakta texts declare that Devi is the Brahman (the Supreme Divine), and that Shiva and all other gods and goddesses are her aspects. Amazingly, the Ardhanarishwari produces her consort Shiva out of herself, perfectly balancing Her Feminine and Masculine aspects. She is atonce the mother and the consort. 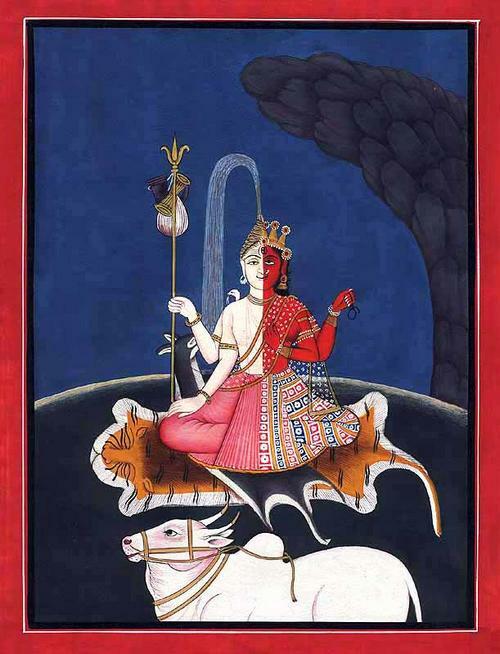 The tantric text Pingalo-panishat (verse 21) describes the Devi. She is seated in the centre of the triangle (trikona chakra) the three sides of which are represented by the three gods Brahma (creator), Vishnu (preserver) and Rudra (destroyer). They are the expressions of the aspects of Shakthi. They are her creations. She is Chinmayi, pure consciousness. She is masculine, feminine and nature .She is the mother goddess, the mother- father of the entire universe. She is the hermaphroditic Devi in the form of Ardha-Nari. At the same time, the other texts describe that in the single character of Hiranyagarbha all the three offices of Brahma, Vishnu, and Siva, are united. He is at once the creator, the preserver, and the destroyer. He is the primeval hermaphrodite, or the great father and great mother blended together in one person. 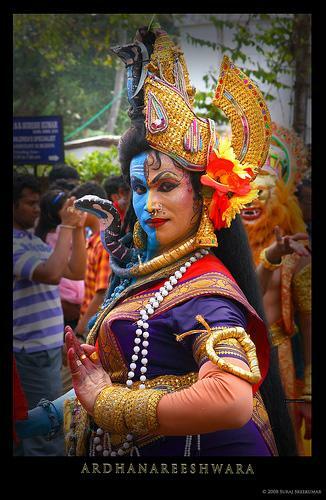 Consequently, he is the hermaphroditic Siva in the form of Ardha-Nari. The Chinese, the Pythagorean, the Orphic, and the Platonic theology regard same great father and great mother united in the single mysterious person of the hermaphroditic Adonis, or Zeus, Phoenician, or Orphic theology. According to Greek mythology Hermaphroditus the child of Hermes and Aphrodite fell so passionately in love with Salmacis, a nymph, that they beseeched Zeus , the king of gods, to unite them for all times. Zeus did accede to their request and joined them in a single body. Since then , it is believed , man and woman reside in each other. The Pythagoreans were fond of expressing such notions by numbers. Similar to this is the Chinese opinion, that one produces two, that two produce three, and that three produce all things. 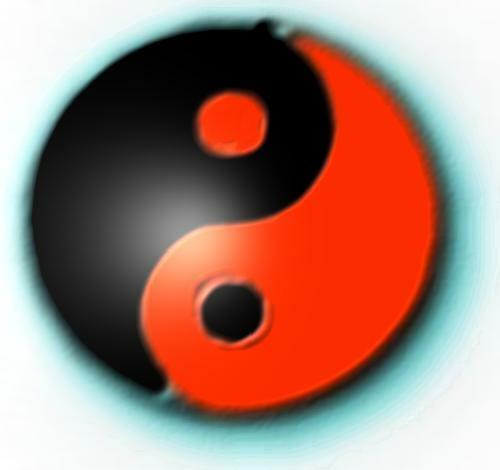 In Chinese Taoism this concept is symbolized by the coming together of YIN and YANG in the Tao. Like Ardhanarishvara the Greek god Hermes, is associated with communication; the intermediate being that often serves to mediate between women and men, mortals and deities, and between other entities. 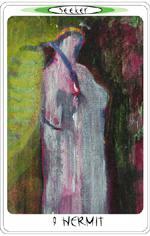 According to some interpreters of Tarots, the central figure is androgyny; and the scarf conceals this fact. This figure represents Truth, just as Ardha –nari represents Truth and harmony in nature. Similarly, the Hermit is the Androgynous keeper of self knowledge. He too wears a veil. Finally, The Supreme Reality is conceived as non-dual, having within it, a subtle duality of Shiva and Shakthi – the Power holder and Power- described as being (Sat) and will (Chit). 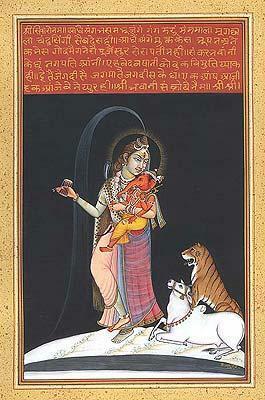 What is called the Power becomes the Mother, Tripurasundari and the Power Holder, Shiva her Concert. Though they are one in principal, they appear distinct. Shiva and Devi both encompass each other’s aspects and each becomes the substratum of Ardhanareeswara. At another level, Ardhanareeswara´s iconographical embodiment of paradox and the meeting of dualities-embodied sonically as well as visually- and synthesis; embodied by individual men and women. The male hormone Testosterone in women and the female hormone Estrogens in men testify to the fact that characteristics of both sexes are present in each one of us. The production of these in our bodies keeps our personalities and our bodies in balance. 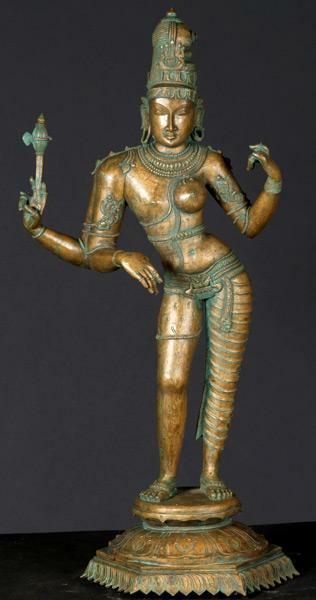 The differences are brought together in the beautifully conceived anthropomorphic form of Ardhanareeswara. The form encompasses everything from action to inaction, eternal rest to endless activity, the terrible and the benign. 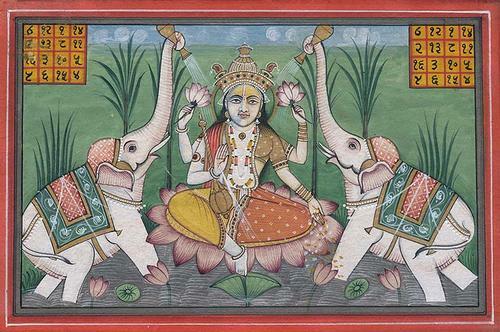 The Devi depicted on the left half of the deity, is the power of god by which creation, protection, and destruction of the universe is accomplished. The philosophy of the Ardhanareeswara places the genders on equal terms without question. Ardhanareeshwara stands for a profound philosophic truth that the female and the male are complementary to each other and it is their combination, the blending of grace and power that contributes to the creation , preservation and propagation of life. It is one of those things; as a concept Ardha-nari is highly fascinating; and one can talk endlessly about it eloquently and even sing in rapture. But as a reality, it is very hard to deal with; and more so live it.It is worse than living hell. Lalitha Sahasranama, Soundarya Lahari and Bhakararaya’s commentary on Bhavanopanishath.